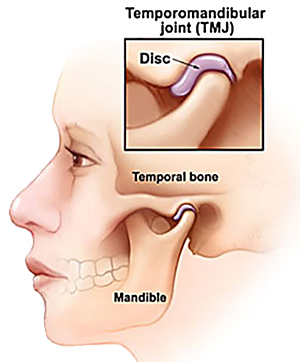 The temporomandibular joint (TMJ) is the joint that hinges your lower jaw to the temporal bone of your skull. Jaw joint pain, clicking or popping of the joint and headaches are common symptoms of a TMJ disorder. The way your upper and lower teeth meet (your bite) during chewing or at rest is known as occlusion. The muscles that you use for chewing and the temporomandibular joint are closely related with regards to how your teeth align. With this is mind, it is important that occlusion be taken into consideration when diagnosing TMJ disorders. As a prosthodontist, Dr. Vahik Paul Meserkhani has an in-depth understanding of occlusion, and he has many years of experience treating TMJ related issues. During comprehensive routine and new patient exams, our doctors carefully and gently check your jaw joints and muscles to ensure your optimum oral health. Misaligned bite. Your bite is how your teeth come together. Misalignments in the bite cause undue stress on the muscles that move the jaw, and on the nerves that control these muscles. Teeth clenching and grinding (Bruxism). Some people are habitual teeth grinders or clenchers, often done unknowingly during sleep. This constant pressure on the TMJ causes the muscles to tense up, leading to various symptoms of pain. Dislocation of the joint from the socket. Stress. People experiencing a great amount of stress can get into the habit of tightening their facial and jaw muscles or clench their teeth. Our doctors frequently work as team, and collaborate with other medical professionals when treating disorders of the temporomandibular joint. We have an associate chiropractor, conveniently located in the same building. He uses chiropractic techniques for muscle relaxation and joint manipulation that help provide relief from headaches, as well as jaw joint and muscular pain. A non-invasive oral appliance helps prevent teeth clenching during sleep and helps your jaw relax. In conjunction with chiropractic treatment, our doctors use oral appliances to provide relief from TMJ pain. These appliances keep your jaw properly aligned, allowing muscles to relax. To correct your bite permanently, Dr. Meserkhani may use crowns, veneers or teeth straightening methods to correct the way your teeth come together. Repairing the bite alignment can provide relief from headaches and pain caused by TMJ misalignment.